Slingshot Discussion Area Slingshot General Discussion Anything other than Polaris Slingshot Related Lady Slingshot Owners New and Old Members Introduction Section. 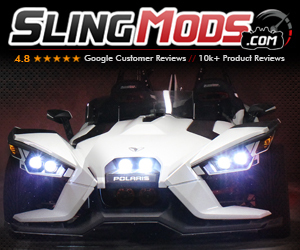 Welcome ....... Slingshot Tech Polaris Slingshot Tech Center DIY or How To ,, Step by Step Forced Induction Power Section Naturally Aspirated Power Section Sam Owens Media and Info Section Events Area Slingshotinfo.com Outings and Events Official Slingshot Owners Group "SOG" Official Slingshot Roadsters Events SS TakeOver Slingshot Events Non Slingshot Related Events Monthly Photo Competition Regional Click Here to see the Regions South West South Midwest Tri-State Texas New England Mid-Atlantic Nevada and Utah Rocky Mountain SoCal NorCal Pacific Northwest Hawaii and Alaska South East DMV District Canada Members Builds Click here to see members builds. FLSling Build Rabtech's Build GP Customs Build Tango's Build Mr Winn's Build FunCycle's Build Macaws Build Kenny's Build Blog Lems902s Build Solow's Build Joe's Build Styln's Build inewton's Build Wolf's Build Br4hm4's Build jluna's build mytoy's Build Travis' SS SL Build PA SLinger Build Stickerdick's Rebuild jwestfall's build Rrherna Build e-Star's Build Ross's Build BatPower's Build Site Information and Latest Site News Suggestions for the site.... Arcade Section- Connect 4 and Gomoku Vendors Slingmods Rock My Bling by JM Designs DDMWorks Slingshotonly Twist Dynamics Welter Performance Spencer@Champion Powersports F4 Customs Sport Rider Inc The Slingshot Garage FixMyToys Ball Equipment CBM Motorsports MeanSling SS Performance AllThingsSlingshot.com SSV Works Slingtunes MYTOY-TOY LLC. Three's da Life R-Shot Accesories CAMFU ZZ Performance Rev Dynamics Lite Your Slingz Multiple items can be selected by holding the “Ctrl/Shift” key (Windows) or “Command” (Mac OS) key and clicking on the desired items. Search all categories -------------------- Main Category Default Category Multiple items can be selected by holding the “Ctrl/Shift” key (Windows) or “Command” (Mac OS) key and clicking on the desired items. All Categories -------------------- Default Category Multiple items can be selected by holding the “Ctrl/Shift” key (Windows) or “Command” (Mac OS) key and clicking on the desired items.